At this time, sheets and towels are needed. Monetary donations allow us to continue our mission to purchase new sneakers, socks, and underwear for school children. The Homeless shelter of Lake County, located at 25 Freedom Rd. 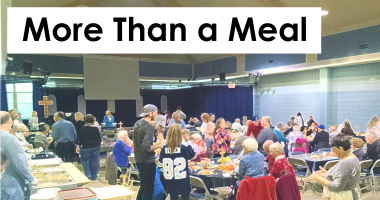 Painesville, relies on volunteers to provide a meal each night for 40 individuals and drop it off at the shelter by 6:45 p.m. Mentor UMC coordinated the first Wednesday of each month and you can help! Contact Nancy Leyden at 255-1567 and she will help to plug you into a group. This is the ministry that uses your home baked cookies to reach prison inmates for God! Praise report for 2017: $376 was collected and will go to Kairos as ‘Meal Tickets’. Meal ticket stubs are signed by the donors (first name and city) and are placed next to the lunch and dinner plates of the inmates so that they realize people outside of the team care for them as well; the money goes towards food and supplies expenses. On another high note, 381 dozen cookies were collected! Last year we collected 284 dozen, so the church set a pretty high bar this year. God is good. Kairos Outside is a Christian faith based ministry that strives to bring healing, reconciliation and forgiveness to women who are affected by the incarceration of loved ones. Kairos Outside provides a comfortable, non-judging Christian Retreat for women to support each other on the journey. The upcoming Kairos Outside weekend will be held in August. You can support this ministry by monetary donations or by attending the upcoming fundraiser … a Shopping Bazaar Craft Fair on Saturday and Sunday, June 2 and 3 at the Patrician Party Center, 33150 Lakeland Blvd. in Eastlake (9-5 on Sat and 10-4 on Sun). For more information, contact Pastor Bev Wrobel at 255-3496 x106 or e-mail blwrobel@mentorumc.org. LCCN helps needy families and individuals in Lake County, Ohio. the community. We keep client records confidential. Click here to visit their website. During your journey in 2018 when will you be the hands, the feet, the smile of Jesus Christ? This is a great opportunity for Journey groups, Committees and families to give back. Opportunities are available for MORE THAN A MEAL. Groups of 4 or more individuals who may not be culinarily versed may sponsor an upcoming meal. Will you be the light in someone’s darkness? help with set up and clean up. Just a few ways you may become involved. For more information you may call or text Jim Post at 440-477-6130. Royal Family KIDS is the nation’s leading network of camps and mentor clubs for children of abuse, abandonment and neglect. Click here to check out their website.